Back in 1998, while their high school friends were throwing graduation caps in the air, the three members of Eve 6 were jetting here and there, playing sold-out shows and being handed platinum records. "It was as amazing and surreal an experience as you can imagine," says singer-bassist Max Collins. The SoCal pop-rock trio (which also includes Jon Siebels, guitar, and Tony Fagenson, drums) made quite a mark in the late '90s with hits like Inside Out, Think Twice and Here's To The Night. In 2004, the band broke up. Collins and Fagenson worked together on a couple of projects, but it wasn't long before they got the Eve 6 itch again. After announcing the re-ignition of the band, they played with guitarist Matt Blair for a time, and last year year they welcomed Sibels back to the fold. "Musically and personally, we've got the 'bro' thing going on," Collins says with a laugh. "Getting back together took a little longer than I might have anticipated, but it's been worth it. We're all connecting, having fun and being a better band than ever." 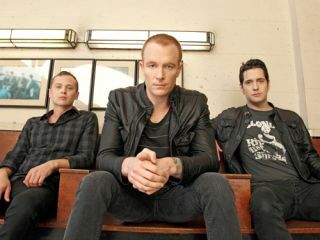 Eve 6 are set to release a winning new album, Speak In Code, on 24 April. Produced by Don Gilmore (who helmed the band's self-titled debut and their follow-up, Horrorscope), it's led by the infectious, Duran Duran-inspired first single, Victoria. We spoke with Collins about the new record, how it feels to have the old gang working and what it was like to hit mega-platinum before reaching legal drinking age. What were the circumstances for the band's breakup in 2004? "There were a few reasons, really. The period of putting out those first three records and the touring cycle that went with them, it was pretty nonstop. We were fresh out of high school when it all started. It was incredibly exciting to have all of our dreams come true in ways we couldn't have imagined possible. I think, mentally and emotionally, towards the end of that third record, we were wiped out. "We needed to breathe and take a step back a bit. There were some efforts to get going again, but John wasn't ready at first, and then our manager, Stu Sobel passed away - all of these things slowed down our trajectory. "All that said, things happily converged, and John's been back in the fold for a year or so. We did some spotty touring to see if we still had an audience, and once we saw that we did, we realized that moving forward was definitely the best thing we could do." Eve 6 came out at the tail end of the glory days of the record business - bands were still going multi-platinum from one song. You're coming back to a very different music industry. "There's a palpable difference in now versus then. It's great to be able to reach our audience through the Internet - there's a lot of power to the artist that wasn't always there - but the downside is that people don't think twice about wanting free music. They expect it now. "As long as we're able to make a living doing this thing, we're over the moon. As the cycle progresses, we'll be able to see things more clearly." Where do you see the band fitting in these days? When your first record was released, you were put in the pop-alternative world. "Yeah, I don't know where we would be now. We've always been a little on the outside of what's happening. When Inside Out was released, there weren't a lot of guitar rock songs - you had a lot of female artists and the Lilith Fair going on, and then a lot of electronic stuff. I remember people thinking that we might slip through the cracks. As to what demographic we're in now… I don't know. We make these exuberant pop-rock records. That's what we know how to do." What was it like for you guys when you put out your first record? Not many people get to sell a few million albums right out of high school. "At first, we were signed to a little punk-rock label out of Orange County called Doctor Dream - they had members of the Adolescents' new bands and things like that. We were set to do a record with them, but a live cassette of ours made it to Brian Malouf at RCA Records, and we wound up getting signed to them. This was when we were still juniors in high school. It was pretty cool." In hindsight, are you happy that things happened so fast and that you were so young? "I've definitely indulged in thinking about what would be different if we spent more time developing before we got signed. But all I can do is think, Hey, it happened the way it happened. There's a whole lot of good about it, and we got an opportunity that a lot of bands and songwriters never get." On the new record, you worked with Don Gilmore again. The band must have a great relationship with him. "We do. Don is like the fourth member of the band. I'm think it was Neil Finn who said, 'A great producer is somebody you admire and feel compelled to show off for.' That's how we feel about Don. For me, as a lyricist, he really pushes me. He'll say, 'This is great, but this can be better,' and he can do it in a way that I trust, that I feel inspired by - I know he's always got the best intentions." There's a bit of an old-school Duran Duran vibe to the song Victoria. Intentional? "Yeah, definitely. I'm glad you hear that. It's funny: Don and Tony are huge Duran Duran fans, and they're way into '80s pop music. I got really into British pop, everyone from The Kinks to Squeeze - Robyn Hitchcock even. So those worlds really influenced the writing of that song." What about the song Curtain? Where did that one come from? "That's an interesting one. I decided to write a song as if it were Noel Gallagher speaking to Liam Gallagher. It started out as a novel idea, but then it took on various other aspects and became my voice. Musically, I'm hoping that I can play that bassline live while I sing. I have to really practice doing that." Speaking of the bass, what are you playing? "I play Fender Jazz basses. I've got a gold and a black one - the gold one is intentionally tacky. Fender made them for me back in 2000. They're from the Custom Shop, with active pickups - sometimes my tech forgets to replace the batteries and they become passive pickups. For amps, I use Ampeg and I go through Eden cabinets. We might be getting some more stuff from Fender." Being that you're a bassist who sings lead, is Sting a bit of a reference? "I dig The Police, but I never went there like a lot of songwriters and players. I'm sort of a surface Police fan. Truthfully, I'm more of a bass player second and singer first. I love the bass, but I don't have any bass-singer idols. I just kind of do it the way I do."